Today will blog about one of my favourite gambits. This opening is known as Blackmar's or Blackmar-Diemer (with moves 2...de 3.Nc3 Nf6) Gambit. This gambit have a many fans, and there are players who are determined and will attack at all costs. Some time ago I flipped through a book about this gambit ... and even played a few games. However, my passion did not last long. And today you know that I am an 1.e4 player. However, one chapter in this book seemed to me particularly interesting. It talked about such a system in the BDG, which was called Von Hennig Gambit, and became possible if Black made a move with c7-c6 for defense. After reading the book, I understand that this gambit is very interesting and gives for White a good chances on attack. Just for a one sacrificed pawn. How do you, for example, like this game? What if? How many inventions started with this question? I asked. What if I rearrange the initial moves a bit? We made sure that this interesting gambit can be used against such a reliable and widespread among players of all levels opening, as Caro-Kann Defence! Hey! We have a some reason for this. Firstly, such a trick works well psychologically. Secondly, the opponent may not know what to do. After all, I never met such a moves order in any book ever before! Thirdly, this gambit must be playable for the active style players. What if this idea is good? I will also say that starting the writing of this blog, I founded some info about the Heinz von Hennig. It was a German player, Kriegsmarine officer (Konteradmiral) and several times the city champion of Kiel (Germany). But he is best known for the Schara-Hennig-Gambit. This is a replay of the opening Tarrasch Defense, with Black sacrificing a pawn in the fourth move. Anton Schara had tried this idea in 1918 in Vienna, introduced by Hennig the variant 1929 at the 26th DSB Congress in Duisburg in the tournament practice; he won against Josef Benzinger. Wikipedia. But the real pleasure for me was the next Von Hennig game, in which he applied his second most famous opening idea. Look at the first moves! He also used this gambit against Caro! I think, I got a interesting idea! And I decided to immediately try an unusual gambit. In the first game I had a successful attack after the typical for this gambit sacrifice. But I must say that the clumsiness with which I ended the attack is explainable by a time trouble. It took me more time to get out of the gambit, which I myself applied! Hu-urra! Winning in this and other games prompted me to continue researching the gambit, and I'm glad that my unexpected hunch gave me a rare and dangerous weapon against Caro. Let's take a closer look at the possibilities of Black to keep this rare gambit alive. Black Bishop goes on g4 and...died! The first of the possible lines (I wanted to use the word “theoretical” lines here, but I remembered that I don’t know any chess literature where these variants would be analyzed) — this is so bad for Black that we can call it opening catastrophe. Why? Just take a look at the Dangerous Trap. OK. What happened on the board? We see that Black missed tactics. Result: White only returned his (gambit) pawn and now the material is equal. But more importantly, the king lost the ability to castle, in addition, the white squares around him are weak. This makes the situation really catastrophic for Black! If you have this position with white pieces, it is natural that you win. Evidence of this is generously scattered in My Good Games, for example #34, #40, #56. Also this video will be useful for you. And often even a very strong player can get caught. Here is my Rapid game against the young Ukrainian candidate (FIDE 2222). It was so fantastic that I could not believe it if I had not played it myself. Line 2 Black Bishop gets under the scope! The second of the possible lines is not so bad. This is the most theoretically known line of the gambit. You will meet her in the repertoire books of GM Boris Avrukh. We see that Black is careful enough to avoid a catastrophe (terrible 6...Bg4 fromLine 1), but decisive enough to play with an extra pawn. I have prepared a diagram to show what dangers await them in the next moves. Here, Black must remember about two Dangerous Traps. Another variations of this trap (with Bishops on e7, d6 and knight's moves on d7) are available for viewing in My Good games ## 1, 2, 19, 25 , 26 and 27 and #54. Enjoy! Beautiful wins, is not it? But is there an mistake here? Is there really a recommendation of one of the most popular chess theorists to play this line? And the main nuance is in the eighth move of Black! If you play against a theoretically prepared player, then be ready for the fact that he knows the maneuver Bc8-f5-g6! 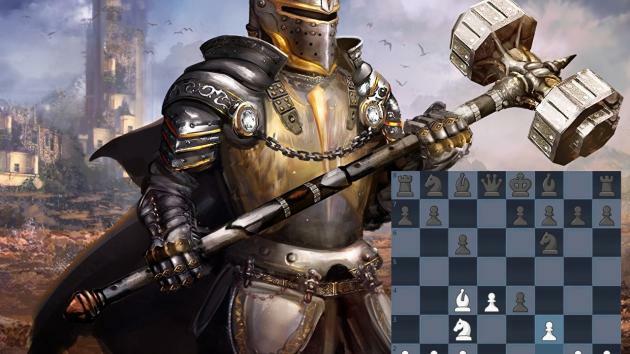 The next game will show us that White still has activity for the sacrificed pawn. Next game was nominated for the Best game of May.